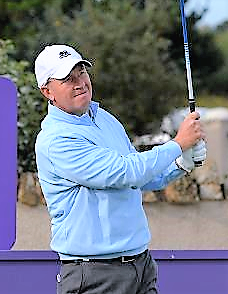 Gary Orr is in pole position to capture his first Staysure Tour title as he prepares to take a three-stroke lead into the final round of the Scottish Senior Open at Craigielaw Golf Club. The Scot, pictured, from Helensburgh, started the day two strokes behind overnight leader Stephen Dodd but carded a scintillating six under par round of 65 on the East Lothian coast. He is bidding to become the first home winner of the Scottish Senior Open since Sam Torrance in 2006. He birdied two of his first four holes and then made a further gain on the ninth hole to make the turn three under par. Consecutive birdies followed on the 13th and 14th holes before tapping in for his sixth of the day on the 18th to move two strokes clear of David Shacklady. “I was delighted with my birdie on 18 today,” said Orr. “It was nice to finish with another on the last. I putted well. There were a few loose shots, but I made a lot of great recovery shots to keep my score ticking over. “I missed a couple of par threes, so I made a couple of good up and downs. The conditions were a lot better today; it was much more scoreable and there were a lot of birdies out there if you made the right shots. Shacklady, who started his day on the back nine, made the turn in level par before an eagle on the par five second saw him move to six under par. He parred the remaining seven holes to sign for a second round of 69. One stroke behind Shacklady is fellow 2018 Qualifying School graduate Paul Streeter. The two Englishmen have also tasted victory on the European over-50s circuit this season with Shacklady winning the VTB Russian Open Golf Championship and Streeter triumphing at the Travis Perkins Masters earlier this month. “It was totally different to yesterday,” said Streeter. “It was a lot more playable for me and it was nice to finish with a two-putt birdie. I putted well from long range today.